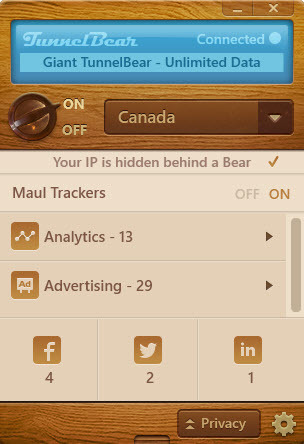 TunnelBear VPN is perfect for those looking for a quick simple way to access the internet through a VPN service. Their very generous free plan allows users to fully experience the service. There are some shortcoming such as the speed being a bit lower and the restriction in P2P but taking into account that it's a free service, we're quite impressed. Canada, the country of the maple leaf, polar and grizzly bears is the location where the headquarters TunnelBear, a VPN service that has one of the funniest and cleverest marketing strategy in the industry. Founded as a company in 2011, TunnelBear is a team consisting of around 13 startup veterans and tech savvies from companies like Microsoft, RIM, Goldman Sachs and Fixmo. At this point, they have servers in 12 countries: US, UK, Canada, Germany, Japan, France, Italy, Netherlands, Sweden, Switzerland, Ireland and Spain. TunnelBear is currently available on 4 platforms: Windows, Mac, Android and iOS. 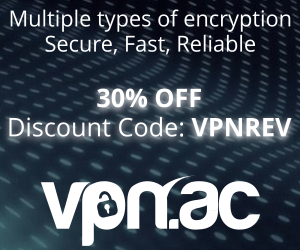 They provide two VPN protocols: OpenVPN and IPsec (on iOS only). On the technical side, for data encryption they use the Blowfish cipher with 128-bit keys, in CBC mode. For authentication, TunnelBear makes use of RSA-2048 keys and SHA1 (160-bit) for HMAC. The VPN tunnel is established over UDP or TCP port 443 only. AES-256 encryption will be available soon with OpenVPN, currently being available with the beta version of their software. In the dedicated page, the download will start automatically. It is not necessary to create an account before downloading the software, it will be created locally on the device after installation. When the account is created, user has to provide some information such as the first name, email & password. Then, after confirming the email address, the user will be redirected to a landing page where a short tutorial on how to use the software is presented. Installing and connecting for the first time takes less than a minute and it is a straightforward process. The software is extremely easy to use. Just sign-in, select a location and click on the On/Off switch to connect. Ads and tracking blocking is a feature available with their software, which is a neat feature. Some other useful features of their software are a kill switch called Vigilant and IntelliBear which allows the user to enable the VPN tunnel only for specific websites or exclude webssites from being accessed over the VPN. On mobile it includes some nice animations during the connection process, where a bear travels through tunnels from a country location to another. Little, which is free, offers 500MBs of free data each and every month. The package can be extended with 1 additional GB, just by requesting it on Twitter. Giant costs $4,99 / month and provides unlimited use on any 3 computer or mobile devices. Grizzly has the same options a Giant, but will provide a 17% discount if you chose to use it for an entire year. So, the price will be $49,99. As for payment methods, users can choose between credit cards, PayPal and Bitcoin, but the later is only available for the 1-year pricing plan. Personal and Financial Data (Cardholder last name, Date of card use, Last four Numbers of Credit Card). According to TunnelBear, all the data above is not stored outside the canadian physical borders, even if they have servers all around the globe. 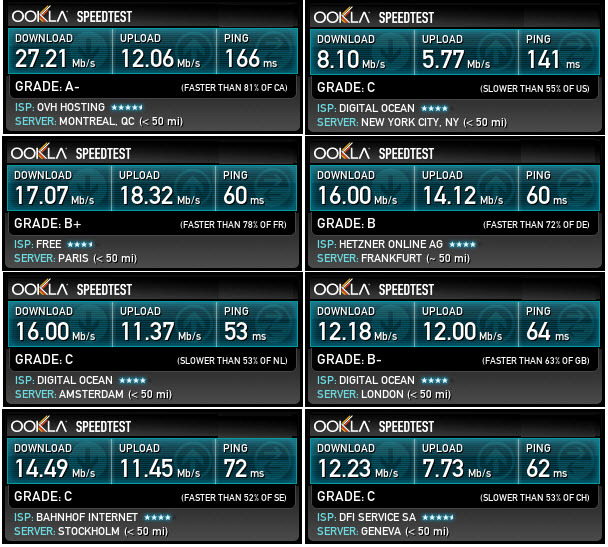 Speed was not that good in our testing, compared to some other competitors. Most of our tests have printed results in the 10 to 20 Mbps, the best being close to 30 Mbps. Though, given the fact that P2P traffic is not allowed, 10 to 30 Mbps should be enough for most browsing activities, including HD video streaming. Speaking of reliability, we had a few problems trying to connect to the Japan location and we couldn’t establish a connection for over an hour. Another issue occurred when connected to Italy, internet not being reachable even though the VPN connection was active. The software provides DNS leak protection by setting Google’s public DNS on all network interfaces, but it was hit and miss: sometimes we experienced DNS leaks as the local network interface was still in DHCP-mode instead of having the DNS server assigned by TunnelBear’s client software. TunnelBear has a detailed help page with answers and solutions to many common questions and problems. The user can get in touch with the support staff using a contact form. At the moment, they do not have a live-help option, but we noticed they are very active on social media channels (Twitter & Facebook). Simplicity: easy-to-use software with useful features. Ads and tracking blocking as an extra-feature of their software. Funny and friendly approach on the website, in the messages, details and software. A large team, that suggest a pretty popular service. Servers in different parts of the world. They use only 2 protocols and OpenVPN can’t be customized to connect using other ports or use UDP instead of TCP. We found UDP to be faster than TCP with many other providers. Bitcoin accepeted only for yearly payments. TunnelBear VPN is nothing but perfect for users who are looking for a simple and easy to use VPN, that not possess advanced technical knowledge and do not have high security needs. It is also useful for those who have a low monthly use of such services (in this way, they could opt for the 1.5 GB package offered monthly for free). Even if speed is worse than what we experienced with other providers, it’s not a big problem since they do not allow P2P traffic, so for browsing only it is reasonable. The lack of customization (protocols, ports, encryption options) makes the service less appealing for power users who care about such options. We rate TunnelBear at 7/10 and highly recommend it to users looking for simplicity and a solid software for desktop and mobile devices. so what do we need vpn service and moreover paid it, if they snoop our credit card? That is not privacy at all! This is a MAJOR issue on privacy isn’t? Can someone tell me how this is safe or at least safer than “Hola Unblocker”? I signed up for it and for IOS clients you don’t give a credit card but pay through Apple who have pretty good security. Also the IOS client subscription is $29 yearly, that’s a good deal. Just installed TunnelBear FREE, no credit card info required. Worked well with BBC iPlayer and UK VPN, so it looks good. The application on both mobile phones and PCs is visually pleasing. They offer several locations. I contacted the support regarding the speed I was having on the Brazil server because it was bad. I got no response within 24 hours. Later, I received a response saying that it was normal to lose speed when using a VPN service. I am in Europe, and I know that speed would be affected by the connection to another continent. But I’ve had several VPNs from Brazil, and this is sincerely bad. Since TunnelBear does not return the money (I’ve applied within the first 24 hours), they can basically do whatever they want. Think twice before buying a VPN here. You are right. I too faced issues with speed when I connected to a Brazilian server. They have slow servers in general, but videos manage to play on the BBC iPlayer.